Fictional food that will either fill your stomach or turn it. From a delicious bowl of venison stew to a raw potato floating in a toilet, these are some of the tastiest and most revolting foods in the history of PC gaming. You can probably make a few of them at home, like WoW’s banana bread, but others are purely in the realm of fiction. Either way, some of them we really want to eat, and others we definitely don’t. Bon appetite. 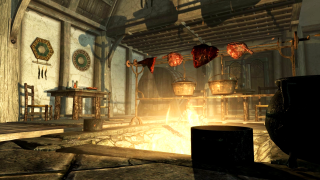 Skyrim’s full of hearty, warming food to fend off the frigid winter. There’s a lot to eat, from juniper berry crostata to seared slaughterfish, but there’s something about the venison stew that just sounds appealing. I can imagine escaping into a cosy tavern and eating it by the hearth. Every time I play World of Warcraft and I see a vendor selling this basic healing item—which restores 2904 health over 30 seconds, stat fans—I start daydreaming about biting down on a soft, fluffy hunk of banana-flavoured bread, then washing it down with a flagon of foaming ale. The Sandvich is an unlockable item for the Heavy consisting of lettuce, tomato, cheese, and meat sandwiched between two slices of white bread, then finished with an olive on a toothpick. A basic yet delicious sandwich that meets the Heavy’s high culinary standards, so must be worth a bite. The promise of cake is a running joke in the Portal series, and became a slightly tedious internet meme, but the dessert itself always looks delicious. It’s a rich, fat chocolate cake topped with coconut and pecan frosting and strawberries. Man, I could really go for some cake now. Geralt’s pockets are always stuffed with food to restore his health in battle, including grilled chicken sandwiches, mutton curries, and baked potatoes. But I’ve always liked the sound of the very good honey, and I like to imagine Geralt scooping handfuls of it into his mouth during a swordfight. Cooking is one of the many ways you can keep your simulated humans happy and healthy, and there’s a huge number of recipes to whip up in the kitchen. This dish always makes me yearn for a bowl of hot, delicious, creamy pasta, and the word ‘goopy’ is just so evocative, isn’t it? “Why don’t you have a pork bun in your hand right now?” asks Sleeping Dogs’ pork bun vendor. This game always makes me hungry, and if you’ve ever had a street food pork bun before, you’ll know the sheer pleasure of it. Seasoned meat and vegetables squeezed into a steamed bun. Perfect. When Ethan Winters is captured by the demented Baker family, he’s invited to a dinner that is truly stomach-churning. The table is loaded with grey, soggy, terrifying-looking meat of an unknown origin. And it’s probably not worth thinking about where it came from. Or eating it at all. The food in Dishonored has always been massively unappealing to me, especially this tin of jellied eels. If you’re unfamiliar, it’s a traditional English dish in which chopped eels are boiled in a stock that cools and forms a jelly, which is as appetising as it sounds. Sorry, cockneys. This low fat, high protein synthesised food can be found in the first two Deus Ex games. “Engineered to provide maximum nutrition, and not a single molecule wasted on added flavor or texture!” reads the Invisible War item description. The most dystopian food on the list by far. BioShock protagonists are famous for madly shoving any food they encounter in their mouths, but Infinite’s Booker takes this too far and gulps down a raw potato found sitting in a dirty toilet. You can read the story behind this mystery potato, from the developer who placed it there, here. A food for the desperate. Most monsters you kill in Don’t Starve drop meat, which will fill you up if cooked, but is also toxic. The purple colouring and thick, nasty monster hair is your clue that eating it isn’t totally cool, but sometimes you gotta do anything to, well, not starve. There’s a lot of disgusting food in Bethesda’s Fallout games, from bloatfly meat to crispy squirrel bits. But there’s something nightmarish about eating a can of processed meat that’s been sitting in a radioactive wasteland for a few hundred years. Imagine the smell when you open it. Revolting. This grotesque 6lb burger is sold in Burger Shot and consists of seven beef patties and an illegal amount of cheese. “This burger may kill you!” the advertisement reads, and it’s not surprising. Just thinking about the meat sweats I’d get after eating this is making me queasy.